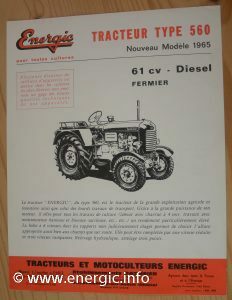 Energic 560 Tracteur from 28/02/1965. 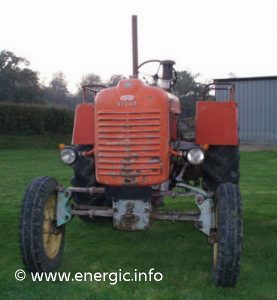 Energic tracteur 560 (61cv 1965). 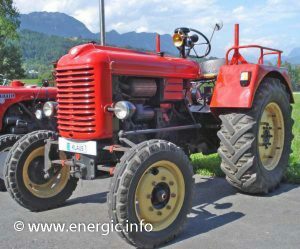 Energic 560 Tracteur – usage medium farm. Cost in 1/05/1965 21 900 frs. 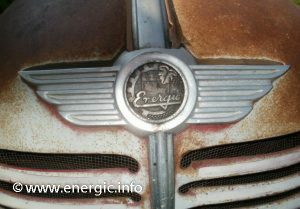 The second biggest engine in the New Energic range.This model was produced in Steyr form from 1955 to 1967 with many modifications. 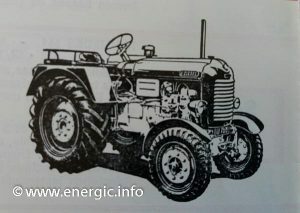 Energic only promoted it for a short period of time from 1965/6 as sales where poor for Energic in this large engined sector, customers preferring Case, Massey Ferguson, Deutz – larger Tracteur manufacturers known for there bigger capacity tracteurs. Originally the moteur was 3991 cm3 (alésage : 110 mm ; course 140 mm) 55cv , the moteur power was modified/increased to 61 cv cv by 1965. This engine was also used in trucks, generators etc. Engine/Moteur. 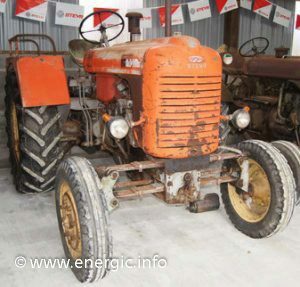 Steyr – WD 313 a, 4 stroke, 3 cylinders, 3,991 cm3, 61cv @ 1850 rpm. Gears. The engine offers 6 forward and 1 reverse gears. Blockage differential. Wheels. Pneumatic Tyre/wheels front tyre dimension 600 x 20, rear tyre dimension 13 x 30. Dimensions. Length: 3335 mm, Width: 1865 mm, Height: 2180 mm, Wheelbase: 2060 mm, Track width: front: 1500 mm, rear: 1500 mm. Weight. 2.8tons. With additional wheel weights of single or double where available. Also it is possible to fill the tyre with water for extra traction and weight. Options. 3 point hitch hydraulic cost 2,750 frs., rear mud guards and seats 750 frs.